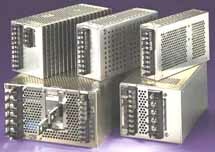 Kepco's RAX are general purpose, single output, industrial grade modules in five sizes from 50-1500 watts. Enclosed construction with barrier strip input/output provides protection for mounting in industrial environments. RAX meet EN 60950, UL 1950 and are certified to the MIL STD 810D environment. RAX Models are obsolete. Availability is limited to factory stock, however modern replacements are also available. RAX are rugged, single-output power modules that can be individually installed or may be combined into a custom power assembly for multi-output requirements. RAX are also DIN Rail mountable. RAX are CE Marked per the Low Voltage Directive (LVD), EN60950.